At Morgan, they’re used to visitors arriving late. Even if the traffic flow through the notorious M5 roadworks doesn’t impede their progress, new arrivals will still wander the confusing roads of the lower Malvern Hills for a while before discovering Pickersleigh Road and the cluster of old factory buildings that has been Morgan’s home for all but three of the past 106 years. When I arrive at the reception centre, I run the gauntlet of Morgan’s everpresent visitors. They throng the place. The company shows nearly 30,000 souls a year through its Malvern Link site and needs 15 part-time guides (mostly Morgan owners) to handle it, which is partly why they charge £20 a head for the pleasure. On this Tuesday, people are already forming happy groups for factory tours, returning or collecting cars they’ve hired, lining up for hour-long paid passenger rides, thronging the Morgan shop (about to be trebled in size to increase stock and ease pressure) or simply hanging out in the spacious café because it just feels good being there. That’s the thing about Morgan: even a mere business visitor feels good being there. I can’t help noticing that while most customers are on the venerable side of middle age, those who cater to their needs are young, well versed in company lore and evidently proud to be there. This already says a lot about the modern Morgan culture and the man whose job is to nurture it. When I finally arrive in his office, Steve Morris, Morgan managing director for the past three years, has already been working for a couple of hours. He smiles and explains that he likes early mornings because you get stuff done before the pandemonium. This isn’t one of those managing directorial jobs where flunkies grease wheels and chase away complications. You get into everything: racing, weekend club prize-givings, dealer visits, car launches to customers, complaints, negotiations with suppliers and everything in between. Right now, Morris is signing a pile of cards as if it were Christmas and not the early summer. It’s because every buyer of a new Morgan gets a note of thanks and congrats from the company’s top man, straight after taking delivery. Plenty of owners have a dozen of these. Morgan people tend not to stray. Morris waves me into a comfortable chair and magics up a cup of tea so we can talk. Turns out Morris is in the wrong office and has been for several years. He’s supposed to be in the one next door, previously inhabited by Charles Morgan and his father, Peter, before that. And founder HFS Morgan in the first instance, of course. This place goes with his old job as operations director, but it has been hard to find the time to move. Still talking, we begin a factory walk, something Morris passionately believes goes with the job. He seems to recognise everyone, although knowing 182 names might present a challenge. We leave the admin building at the top of the site (one of the original two put there by HFS in 1913) and work our way down through buildings that have gradually grown down the hill, away from Pickersleigh Road. Today, there’s a modern paint shop to one side and an even more modern final assembly building farther down the site. Whisper this, but Morgan isn’t only old stuff. 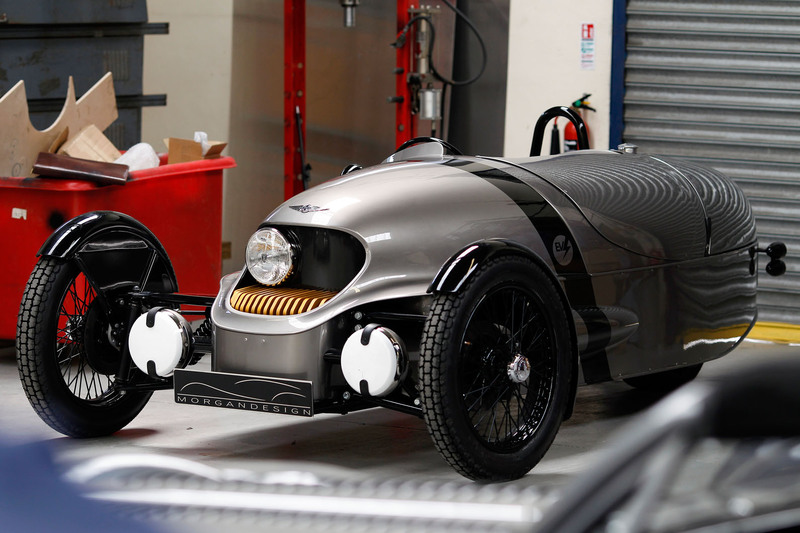 The company’s big preoccupations at present are to build up deliveries of the new Aero 8 (Morris has just taken delivery of his own) and to progress the EV3, the superbly styled, battery-powered version of the 3 Wheeler that caused such a stir at the Geneva motor show in March. The MD is heading into meetings about both. Even so, he automatically stops at areas of journalistic interest. It’s clear he could never be remote from the nuts and bolts of things. He swings big superformed panels about and picks tiny components out of bins with the aplomb of a technician, because he was one. A local lad, Morris joined the company at the age of 16 as a sheet metal apprentice, after being repeatedly coerced by his father into asking for a job. After that, his career headed upwards, propelled by a work ethic, ambition and an ability to get on with people. He made foreman, helping to modernise archaic work practices, and then went into higher education at Birmingham City University, “because I couldn’t see myself making bonnets forever”. After that, the Morgan family perceived his qualities and took him into the upper echelons of the company. He has been boss since 2013 but on the board for a decade. We’re late for the EV3 review, which takes place adjacent to the old factory buildings in a little shed once inhabited by Chris Lawrence, a celebrated engineer with strong Morgan connections. Now it houses new chief engineer John Beech, head of design Jonathan Wells and their teams. From outside, the building looks barely bigger than a double garage. Inside, it turns out it has snug accommodation for seven or eight people. People know it’s quaint, but no one complains. Morris pulls up a chair to Beech’s desk and they start talking schedules. It’s all very well for a prototype to win approval at a motor show, but the EV3 – for which Morgan already has platoons of customers – needs some very different powertrain pieces sourced from very different suppliers. Is it going okay? Meanwhile, the designers are working on a very different kind of launch. Selfridges, the upmarket store, will show and sell the first 20 production EV3s in a unique guise. Dealing with them has mostly been happy, I’m told, but their priorities are different from those of ‘normal’ car dealers. Are they still happy? The discussion arcs back and forth like a Wimbledon tennis ball, running right through the minutiae of making a new kind of car. Meanwhile, the EV3 sounds fascinating. It will mimic the performance figures of the regular, petrol-powered 3 Wheeler and offer a range of around 150 miles. Today’s meeting throws up concerns over timing and battery spec and supply, but no major problems. Still, sitting in a meeting like this brings home to the layman the risks involved in making cars, especially for a small company. But then, as Morris reminds me, Morgan people have been accepting them for more than a century. One more stop down the hill, away from Pickersleigh Road, and we’re in the final assembly and inspection shop, which is full of Aero 8s nearing the delivery stage. They look superb, but the boss eyes them extremely closely because an event called ‘Dealer Collection Day’ is looming, and no one is more critical of a new car than the guy who has to sell it. Thankfully, demand has been hearteningly strong. Back in the office for a sandwich lunch at Morris’s desk, which, I gather, is the norm unless there are VIPs about. Delicious, anyway. I touch on Morgan politics. For a bloke whose elevation to the top job at Morgan has been surrounded by a fair bit of internecine strife, Morris seems remarkably uncomplicated. He handles questions about the 2013 removal of former MD Charles Morgan, sensational at the time, by playing what I’d describe as a friendly dead bat: he simply reckons it’s ancient history. Charles Morgan did things the board didn’t like and they showed their displeasure. End of. The next meeting isn’t on the agenda, but we wander across to the visitors’ centre for a review of Morgan’s web and social media publicity surrounding the Geneva show. There has been a big spike: lots of youthful interest in the EV3 that spread to the Aero 8. Everyone seems happy with the credentials of the visitors and the way they hung around on the site. The meeting goes into numbers I probably shouldn’t report, but it’s fascinating that in a seven-person group, only Morris and I are older than early 30s. Reports of younger people not ‘getting’ Morgans seem quite wrong. It’s paying for the cars – or any sports cars – that’s the hurdle. 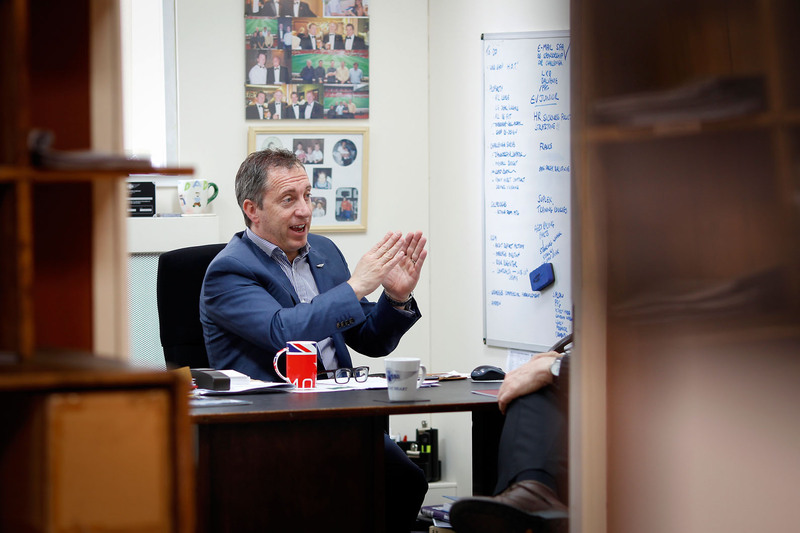 Back in Morris’s office, I meet Phil Arch, a skills expert with strong university and academy connections, whose job is to put graduates into companies that need skills. He has a strong 13-year relationship with Malvern Link. This is a project close to the MD’s heart and he takes time with it. Morgan has accepted and developed many young people since Arch got going, has benefited from it and wants more. “We’re an open book,” says Morris. Morris says goodbye. The M5 is about to close in on me, we both know. Besides, he has a couple of hours’ work ahead, doing things he couldn’t tell a hack about. Not yet, anyway. I’m overloaded with info but also full of exhilaration. Morgan is an inspiring place, and much of that is due to its remarkable young team of movers and shakers, led by a youthful MD. Undisturbed, however, is the timeless quality Morgan has always had, something everyone takes as a given. Who’d bet against Morgan being at Malvern Link in another century? Not them, and not me. ... as the factory tour is highly recommended. Like an open museum, except the main business is building cars rather than selling tours. Probably.